An ideal entrance into the sleek medium format system, the silver Hasselblad X1D-50c Medium Format Mirrorless Digital Camera with 30mm Lens Kit from B&H bundles the mirrorless body with the wide-angle XCD 30mm f/3.5 prime lens. 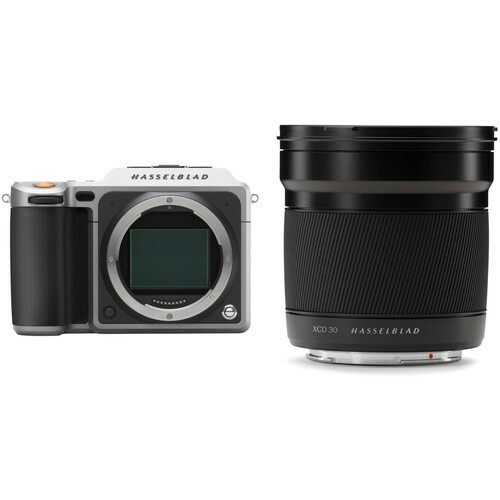 With a sleek design to match the X1D camera system, the XCD 30mm f/3.5 Lens from Hasselblad is a wide-angle, 24mm equivalent prime designed to cover the camera's large 43.8 x 32.9mm sensor area. This wide lens, with a 71° angle of view, is well-suited to landscape, architectural, and reportage shooting applications. It also features a 1.3' minimum focusing distance along with an optical design meant to maintain image quality and sharpness throughout the focusing range for accurate depiction of close-up subjects. Like other XCD lenses, the 30mm f/3.5 has an integrated Central Lens Shutter that is capable of shutter speeds up to 1/2000 sec with flash sync at all speeds, and its internal autofocus design can be manually overridden for precise manual focusing control. Box Dimensions (LxWxH) 10.3 x 9.3 x 5.8"
XCD 30mm f/3.5 Lens is rated 5.0 out of 5 by 3. Rated 5 out of 5 by Peter L. from Professional When I first purchased the X1D, the only lens I had was the 45mm which I used extensively. As the X1D has matured, it seems so has the glass. The 30mm feels much more substantial and sturdy than the 45mm (as does the 90mm). It's slightly larger than the 45 but quite a bit heavier. It balances very nicely on the body... better than the 45 or the 90. Optically it's quite nice in the real world. If you shoot scales and targets, you'll see a little bit of barrel distortion and some light falloff. It barely warrants correction unless you're shooting architectural stuff. The focus ring is smooth as butter and doesn't slip at all. This is the lens that lives on my X1D unless there's a special case, until the 21mm comes out, of course. Rated 5 out of 5 by Michael from Great wide angle for the X1D The introduction of the Hasselblad X1D and the initial 3 lens lineup, is a game changer for medium format photography. The 30mm XCD (24mm in 35mm DSLR equivalent) is the widest lens in the current lineup. It's diminutive in Medium Format terms. But a bit bulkier than the 45mm and 90mm lenses. The lens balances well with the X1D body. Images are very sharp across the frame. Minimal vignetting. The lens is also compatible with Hasselblad's free Phocus 3 software. That means when an image is loaded into focus from the X1D, all the lens corrections, CA, Vignetting, color shifts, will be automatically performed by Phocus. This is a great wide angle lens, with great IQ. i'm looking forward to Hasselblad's next release for the X1D. A telephoto would be nice.